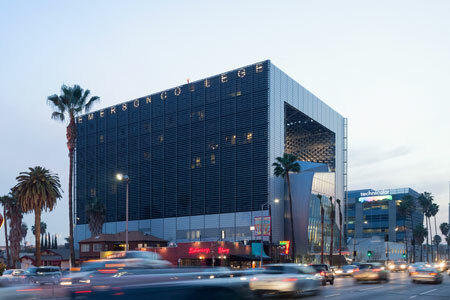 The Hollywood Emerson College campus, which opened on Saturday, stands out as a sustainable and architectural achievement in Hollywood. Although Emerson College’s Hollywood campus officially opened on Saturday, I noticed the massive sleek cube on Sunset Boulevard a few weeks prior to the opening, while en route to the Arclight. It drew my attention amidst the surrounding lower scale restaurants and bars. Its façade glimmered in the sunlight and its open square center drew my eye in, nearly causing an accident as I drove past the building looking for parking (yes, I was driving—I was a bad planner that day). “The building is designed to expand the interactive, social aspect of education. We focused on creating with the broader community in mind—both in terms of public space and sustainable design,” the building’s architect, Thomas Mayne stated in a previous article. The entertainment and media arts institution, designed by the award-winning architect, has an exterior that showcases a shading system that allows the exterior to adjust according to the weather in order to facilitate ideal levels of natural light and indoor temperature. Besides the innovative exterior shading system, the building is made of recycled and renewable materials, contains a glass wall-curtain that has a cooling effect, a live green wall, water-conserving features, and a central system that tracks total building efficiency. The school is also transit-adjacent—within half a mile of the Hollywood and Highland red line stop. What was once a parking lot in the middle of a nightlife hub is now home to a 10-story, state-of-the-art building that will be incubating the entertainment minds of the future. I can definitely get used to more of these establishments diversifying the uses in nightlife-heavy Hollywood. It might just improve the parking situation. To register for a tour of the building, click here.